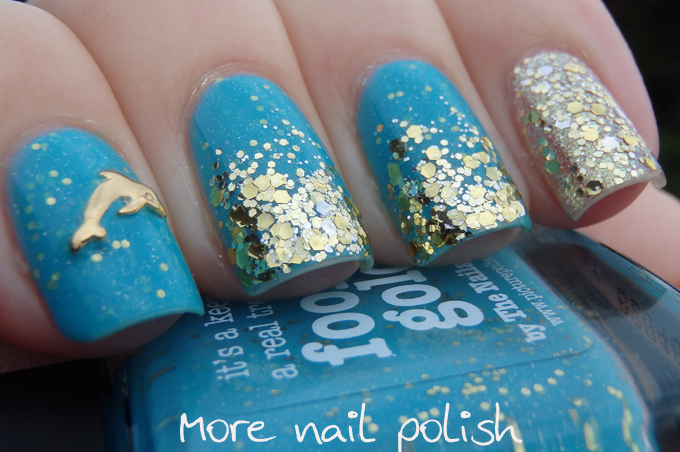 Picture Polish Fool's Gold, the collaboration shade with nail blogger and art superstar Sammy The Nailsaurus, is a stunning turquoise blue with a scattered holo flakies and small gold hexes. 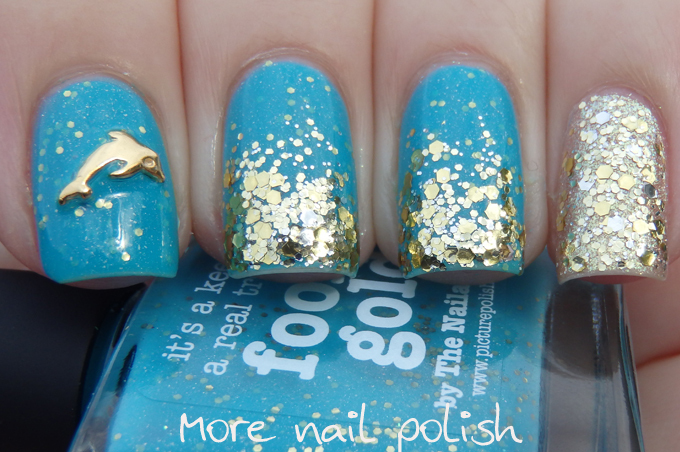 The formula is perfect and mix of gold and turquoise feels very rich. Here are my swatches of this beauty, shown at two coats with Seche Vite top coat. How did I wear it? Well, I had to try really hard and force myself not to do turquoise stone nail art with this polish, that was already done beautifully by Sammy herself and Tammy from OhMyGosh polish. Instead I pulled out some other polishes and really blinged it up. On my pinky I did two coats of Picture Polish Majesty and then a layer of Rocky. On the middle and ring finger I did a tip gradient using Rocky. On my index finger I added a gold dolphin hex nail charm. 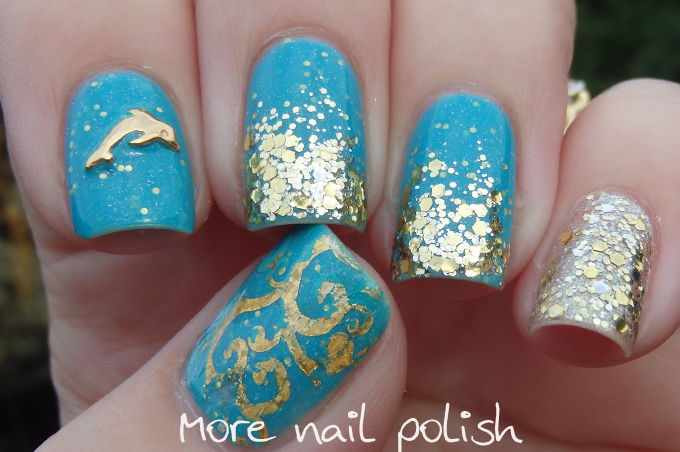 On my thumb I attempted some stamping with gold nail art foil, as I had done here. It started out good, and then my brain exploded as I was applying top coat, and I instinctively painted good old Seche Vite on all my nails. Then I watched the gold foil lose all it's foily goodness right before my eyes. Oh well. It looked pretty awesome before Seche Vite ruined it! 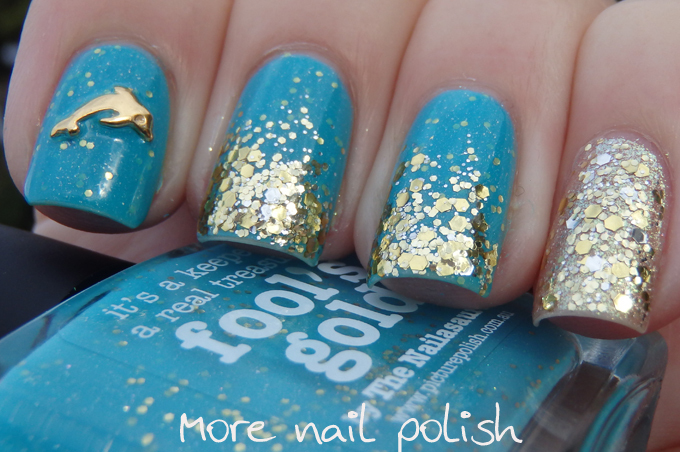 Picture Polish Fool's Gold is available from Picture Polish. International ladies can purchase through one of the many Network stockists. This is so pretty! I love Fools Gold but it looks even better with the glitter on top. So beautiful! I love the dolphin!